Andrew Flachs, an environmental anthropologist at Purdue University, uses the term to describe a movement of younger people new to agricultural work who do it for different reasons than the conventional farmer. They may be motivated by higher education, personal politics, disenchantment with urban life, or the search for an authentic rural identity, he says. In a new paper in the journal Rural Sociology, Flachs identifies several hot spots where this movement is really taking shape: the West Coast, central Texas and Oklahoma, central Florida, and the Great Lakes region. 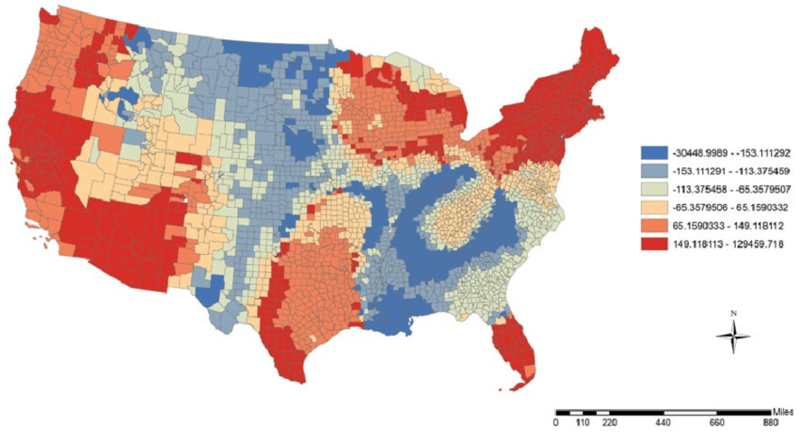 "Sometimes when we think about these farmers, we picture young people with liberal arts degrees..."
In collaboration with Matthew Abel, an anthropologist at Washington University in St. Louis, Flachs built a model that counts how many traits associated with new American agrarianism appear in each county. With data from the USDA agricultural censuses from 1997 to 2012, they considered factors such as average sales per farm, number of certified organic farms, owners under age 34, number of farms selling directly to individuals, proximity to farmers markets, and more. The findings show that newer farmers appear to thrive on the outskirts of cities that provide high demand and purchasing power, a large population, and a healthy number of farmers markets. Identifying where new and small farmers live and work will pave the way for further research on what’s motivating this budding sector of the agricultural economy. New American farmers occupy an important intersection of niche marketing strategies, environmental politics, and rural demographic change that could have a significant impact on food production and social life in agrarian landscapes, according to the paper. Funding came from Purdue, Washington University in St. Louis, and the Volkswagen Foundation.